I chose this name for my very first "Name of the Day!" It is one that I've recently discovered and fell in love with. The name Lavinia ranked on the Top 1000 chart from 1880-1929 and hasn't been seen since then! 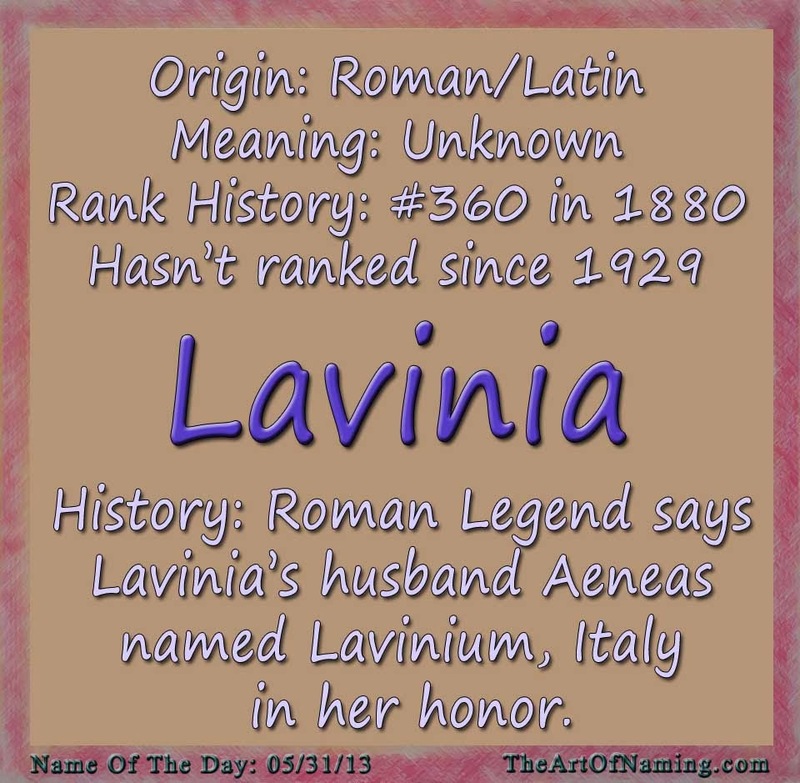 An old name that dates back to Roman Mythology, Lavinia was considered the mother of the Roman people. 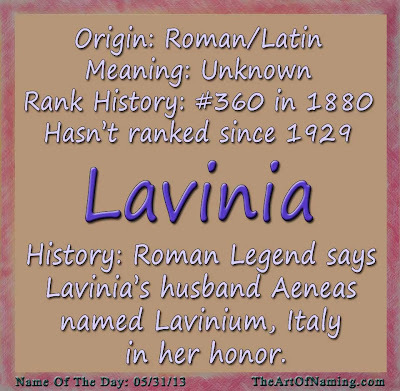 She was the wife of the Trojan hero Aeneas and he named the Town of Lavinium, Italy after her. In Literature, Lavinia was the protagonist's daughter in Shakespeare's "Titus Andronicus" which includes the line "She is Lavinia, therefore must be lov'd." There is also a Lavinia in "The Hunger Games" series, which may have caught the eye of our younger name-enthusiasts! American actress Ava Lavinia Gardner wore the name gracefully during the Old Hollywood days. Emily Dickinson's younger sister was known as Lavinia "Vinnie" Dickinson. And an Italian painter wore the name from 1552-1614, Lavinia Fontana. In Pop Culture, (and where I first heard of this lovely moniker,) there was a character on the British period drama "Downton Abbey" named Lavinia Swire. Have you ever heard of this old-fashioned gem before? If not, I'm proud to introduce it to you. I would personally love this name paired up as a middle name to Ivy. Ivy Lavinia sounds beautiful to me!